It’s 2011, and technology is everywhere you look—the internet, GPS technology, smart phones and so much more have all become a huge part of our everyday lives. As parents, it’s our job to help children safely navigate this vast world of technology. But how can we encourage them to use technology in a constructive, educational and/or creative way? · Create a Website. One reason teachers often include a visual component (such as a poster or diorama) when assigning a big project is because they understand that the creative aspect makes learning a lot more enjoyable. Having your child create a website about something they’ve researched has the same effect: it gives them an opportunity to take something they’ve learned and present it in a creative, visually-appealing way. There are sites that will allow you to build a website for free—but if you want to get into the nitty-gritty of website building, basic HTML code is easy to learn and all you need to experiment with it is a program like Notepad! · Start Blogging. Blogs are a great outlet for creative expression, and they can be focused on virtually any topic. Unlike a traditional journal, blogs are easy to share with friends and relatives, and doing so provides a great opportunity for kids to receive feedback. (What blogger doesn’t love comments?) For those concerned about privacy, most free blogging services allow you to keep your blog hidden so that it won’t appear in Google or other search engines, meaning that it can only be accessed by those who have the link. 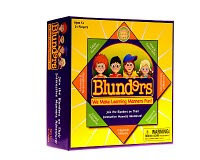 · Educational Video Games. Educational games have been around for a long time. In recent years, however, the “edutainment” market has exploded as educators and developers alike have recognized the great potential of learning that is both interactive and fun. There are plenty of educational games that are backed by research, so why not give it a try? · Photography. Most of us have used a digital camera, but did you know that there are cheap digital cameras out there designed specifically for kids? The cool thing is that many of these cameras come with software that allows kids to edit the photos, so they can get some experience with computer software as well. Of course, there are many ways to help our children become proficient with technology. What are some of yours? Jessica Thompson is a former language arts teacher who currently works for Mentor Interactive, a company that develops educational video games for children. When she's not working or spending time with her family, Jessica enjoys reading, writing, experimental cooking, and playing with the latest technological gadgets. Her husband and two beautiful daughters are her life! Free St. Patrick's Day Subway art from Today's Fabulous Finds. There are several variations to choose from. Pick up Green or Black frames and frame these for Teacher gifts Click here to choose and print yours today. It's a DEAL and a GIVEAWAY - for one week only Tanga is offering three fabulous magazine deals and two giveaways. So, if you are in need of some new mom reading material or gifts now is the time to subscribe to these great mom magazines. WIN: Tanga is giving away a $25 Tanga Cash Gift card to TWO of our 24/7 MOMS. US entries only and one entry per person. Winner will be chosen on March 6, 2011. Click here to visit Raisels Facebook page. Click here to visit Raisels Twitter page. 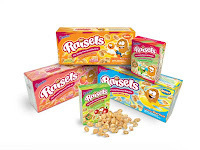 WIN: 24/7 MOMS and Raisels are a giving away a prize package of a variety of Raisels. US entries only and one entry per person. Winner will be chosen on March 12, 2011. **We received complimentary Raisels for review no financial compensation was received. Drum roll please...... last weeks MOMTOURAGE Winner is Shawn Harrington This weeks giveaway was the Set of JUNO products- Congratulations. Q: What is something mischievous you have done? Q: What happens to tires when they get old? Create your own Button Rainbow Framed decoration for St. Patrick's day with this FREE printable from Funky Polka Dot Giraffe. Click here to download yours now. This deal is perfect for school age kids - I personally use Mabel Labels on my kids belongings including their Lunch boxes, school supplies, toys and cloting. They make my mom life simple when it is time to label things. Mabel's Labels - pay $10 for $20 Worth of Organizational Labels from Mabel’s Labels. Prices. Click here to get deal now. *Plus use code FRIENDS20 and get an additional 20% off of your Mampedia deal making it only $8.00. Tune in for wild musical fun with everyone’s favorite purple dinosaur, Barney and his playground friends, in the all-new Barney: Musical Zoo now available on DVD, Digital Download and On Demand from Lionsgate and HIT Entertainment. Trusted by moms and adored by children, Barney displays sharing, caring, imagining, dancing and learning on television, online and through live events, home entertainment and publishing. The Emmy® award-winning series, Barney & Friends is one of the top-rated preschool shows today, airing on PBS KIDS® and PBS KIDS Sprout®. The DVD also includes a bonus episode of the all-new Preschool TV series, Timmy Time from the Academy-Award® winning Aardman studios. Hear an elephant trumpet and a lion roar as Barney and Riff create a wild concert filled with exotic animal sounds in Barney: Musical Zoo. Join Riff as he composes for a different kind of puppet show and then BJ and Baby Bop get into the act, learning about rhythm and performing for others in this super-dee-duper orchestral treat that the whole family will enjoy. 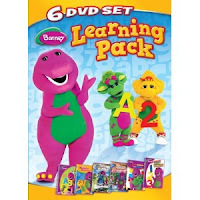 Celebrate the gift of learning with Barney in this jam-packed 6 DVD compilation, containing educational episodes focusing on colors, counting, nursery rhymes and learning the alphabet. A great value, this gift set is the perfect present and a tee-riffic opportunity for your preschooler to learn important lessons with Barney & Friends. 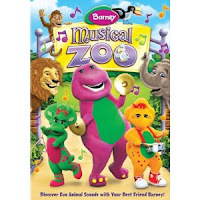 WIN: 24/7 MOMS and Lionsgate and HIT Entertainment are giving away a Barney Musical Zoo DVD. 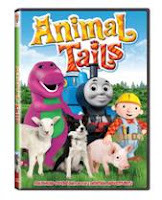 **We received a complimentary Barney Musical Zoo DVD & Barney Learning Pack - 6 DVD Set for review no financial compensation was received. Q: What has been your best work of art? Describe it. Q: Why do hurricanes travel so fast? A: Because if they travelled slowly, they'd be known as slow-i-canes. 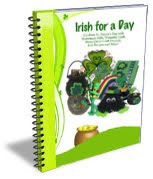 FREEbie - Irish for a Day: St. Patrick's Crafts and Recipes eBook. Free Offer: Irish for a Day: St. Patrick's Crafts and Recipes eBook. #2 Cookie Jar Fun - Pay $10 for $25 Worth of Cookie Jar Fun, Educational DVDs at Special Mamapedia Prices. Click here to get deal now. *Plus use code FRIENDS20 and get an additional 20% off of your Mampedia deal making it only $8.00. #3 Mabel's Labels - pay $10 for $20 Worth of Organizational Labels from Mabel’s Labels. Prices. Click here to get deal now. *Plus use code FRIENDS20 and get an additional 20% off of your Mampedia deal making it only $8.00. Your child is now a budding dancer – complete with bun, leotard, chiffon skirt and pink ballet shoes. In 15 years, she’s going to take the stage and be the next Anna Pavlova! That, of course, will take years of hard work and training. But you can make a significant contribution to your child’s dance career early on by ensuring you buy proper-fitting ballet shoes. When ballet shoes fit, they should fit like a snug sock and move with the feet. If they are too tight, the toes will curl inside and the back will cut into the achille’s heel – a painful way to dance. If the shoes are too loose, the shoes will look “floppy” and the child will struggle through jumps and turns. Proper-fitting ballet slippers don’t have to cost a lot. The typical pair runs anywhere from $15-20 and with the internet, you can buy them online if you know your child’s size. For the first pair, it is recommended that you get your child fitted at a store that specializes in dancewear. Inevitably, as your child grows, you’ll need to invest in new shoes to maintain the proper fit. But don’t despair, as you can buy shoes that are a ½ size larger in some cases so they can grow into the shoe. Be careful to ensure the fit is not too loose for the child. Ballet shoes often run a few sizes smaller than street size, so if you noticed your child’s street size increasing, it might be time for new ballet shoes. If you’d like to learn more about how to buy ballet shoes, visit Best Ballet Shoes. The 1960s and early 1970s were the age of raw American automotive power. Whether it was a classic Hemi ‘Cuda, Pontiac GTO, Charger, or Boss Mustang, big engines were king at local drag strips and cruises. Muscle Cars explores this era and the current models with a broad survey of classic muscle and today’s new machines. Each chapter is organized around a theme (milestones, factory racers, etc), each model getting a multi-page spread of full-color photography, performance stats, trivia, and more. Photos and stories from the people who built and raced these amazing machines make the book a must-read for any fan of American muscle. WIN: 24/7 MOMS and First Gear are giving away a Muscle Cars book. **We received a complimentary Muscle Car book for review no financial compensation was received. Q: What part of a clock is always old? Prevention.com Packaged Foods Webcast from Brian Boyd on Vimeo. Mrs. Manners Says - a Manner variation of Simon says. During dinner or family time Mrs. Manners calls out good or bad manner actions to those playing the game. If it is a good manner the players are to act it out, if it is a bad manner players are to remain still. For example Mr.s Manners calls out "chew with your mouth closed" players all chew with their mouths closed. If Mrs. Manners calls out use your shirt sleeve to wipe your mouth, players are to remain still. If a player makes a mistake and does a bad manner action you can choose to have them sit our the next round of play. The kids are out of school for a snow day and its cold out. The “I’m bored” syndrome is hitting your home. What is a mom to do with a group of bored kids on those long snow days? Fear no more! Here are 13 fun ideas to cure the “I’m bored” syndrome in no time. To read the full article and see my list of 13 fun ideas click here. Baby in Bliss is a new CD and DVD that brings out peace, calm, joy, love, focus, and inspiration in children and helps deepen the bond between mother and baby. The drum beats of the melodies are said to connect us to our pulse and our heartbeat, grounding us back to the rhythm that began in the womb. 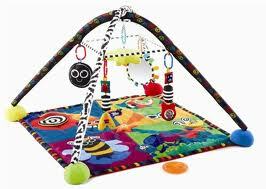 It’s great for newborns through young children. The tracks are titled spiritual themes ranging from Peace, Gratitude, Love, and many more. Instantly calming and contagiously happy, Baby in Bliss is grouped with melodic voices, inspirational lyrics, positive messages, and beautiful instrumental accompaniment. WIN: 24/7 MOMS and Baby in Bliss are giving away a Baby in Bliss Prize Pack including: CD, DVD, one bib, and two onesies. **We received a complimentary Baby in Bliss product for review no financial compensation was received. WIN: Crocs, Inc. is giving away a pair of Crocs Tone shoes. Click here to enter. WIN: Sassy is giving away all 3 products: Rock Star Developmental Gym, Teething Feeder & Silly Squirts. Click here to enter. WIN: Case-Mate is giving away a DIY Case-Mate Case that you can crate and personalize. Click here to enter. WIN: Munchkin, Inc. is giving away a Munchkin Safety Gate (the Auto-Close). Click here to enter. WIN: Neve Designs is giving away a Neve Designs Electra Sweater (winner chooses color). Click here to enter. WIN: Lionsgate & Hit Entertainment are giving away an Animal Tails DVD. Click here to enter. WIN: First Gear is giving away a Hot Rods book. Click here to enter. WIN: HEXBUG is giving away a HEXBUG Nano Habitat Set. Click here to enter now. 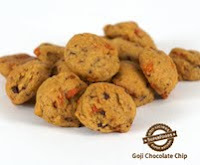 WIN: Goji Gourmet is giving away a $25.oo gift certificate to Goji Gourmet. Click here to enter now. Q: How many hours do you spend on your computer each day? How much time do you spend "surfing the Web"? A: A skunk with diaper rash. Arden Clise shared these tips with us on Kids and Manners during this week Live Webcast. · Chew with their mouths closed and chew quietly. · Wait to eat until everyone has been served. · Put their napkin on their lap and to use it to wipe their mouth but never to blow their nose. · Don’t eat with their fingers unless they are too young to use utensils. · Teach them how to use their utensils properly. 2. Introduce themselves and others. · Don’t just wait to talk. · As parent, reinforce listening skills. Put Blackberry down. Be a good role model. · Kids need to be reminded and prompted. 1. Have a supply of note cards on hand. a. Say thank you for the gift or whatever it is you received. b. Let the giver know what you plan to do with it or have done with it. d. If your child didn’t like the gift or received a duplicate have them say something about how thoughtful it was of the giver to give them a gift. 5. Be nice and courteous to others. · Be kind to others and don’t intentionally hurt people. · Say please and thank you. Hanging out at LEGO land this week with my two of my LEGO addicted boys got me thinking about fun craft projects boys might be able to do with a LEGO theme. 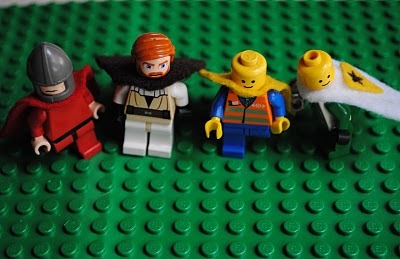 In my search I came across this fun idea from Zakka Life - LEGO capes. This would be a great LEGO birthday party activity as well. Click here to get the complete how to instructions. Coupon Myths Busted- to Your Benefit! A: Learn to find coupons for items you use. Contact companies which make the products you use. Enlist the help of friends and family, and you’ll be blessed with more coupons. B. Your couponing may be more profitable at drugstores, retail/malls, dining, travel, or services. Whatever you want to save money on, focus your money-saving efforts on that spending Research “best buys” on what you buy and you’ll succeed. Buying generic products is the cheaper way to shop: Certainly, we first promote the use of comparison shopping and do agree that generics are often as good/better than the brand name products for everyday shopping. However, if you can "stack" a coupon with a sale (and any additional Catalina/Rebate/Promotions) – you’ll stock up on your favorite brands for less than generics. Knowledge, tools and a little practice work wonders. When people have preferred brands or will only buy a “brand”; couponing can help you afford your favorite products. My husband doesn’t support/see the benefit of couponing. Once you’ve racked up a series of money-saving successes, show him the receipts! Find his motivation – what does he want to be able to afford? When he sees that buying “his likes” doesn’t break the bank, he’ll be on board. If he’s a numbers guy, add up your savings at the end of the month, and hand him his share to save for a rainy day – or towards his goals. Couponing means too much clutter: Simply put, you have to be somewhat organized in order to save money and enjoy the process. Find and create a couponing system that works for you. Binders and files can often be bought at the thrift store. No need to buy expensive couponing tools, as ones you create will often grow with you. Realize that what you start working with may change, as your interest and success in couponing increases. Coupons are only for junk/processed foods and unhealthy cleaning products: Sure, the newest kids’ cereal and whamo-cleaning products are promoted through coupons. Baking supplies, toys/games, plain oatmeal, baby products are as well. Homemade is always the best – but couponing can make meals and cleaning more affordable for those who use prepared products. Housewarming or “New Baby” packages made with an assortment of convenient products are appreciated – those gifts can save you money. Food banks love peanut butter, canned chili and soup – if you can get it free or for far less – double your donations and shop with others in mind! None of my friends use coupons - I don't want to be "weird". If "normal" is paying way too much of my hard-earned money on everyday things - I'll be weird. You can change the "normal" in your circle when you share how couponing and frugality helps you reach your goals. Couponing can be added to nearly any social/activity - and it has so many more benefits than getting together to spend money. Soon enough, your friends are competing and enjoying the search for a good deal. Couponing takes too much time: For the first 90 days, like any other new life change or hobby, you will spend more time than those who are “experienced”. “Couponing”, the process, has become more efficient thanks to the internet. Bloggers with money-saving websites feature weekly “What’s on Sale” lists, which do the matching of coupons to sale for you. Coupon databases track what coupons are distributed when; all you need is your set of filed inserts and scissors – and you’re saving money in no time!